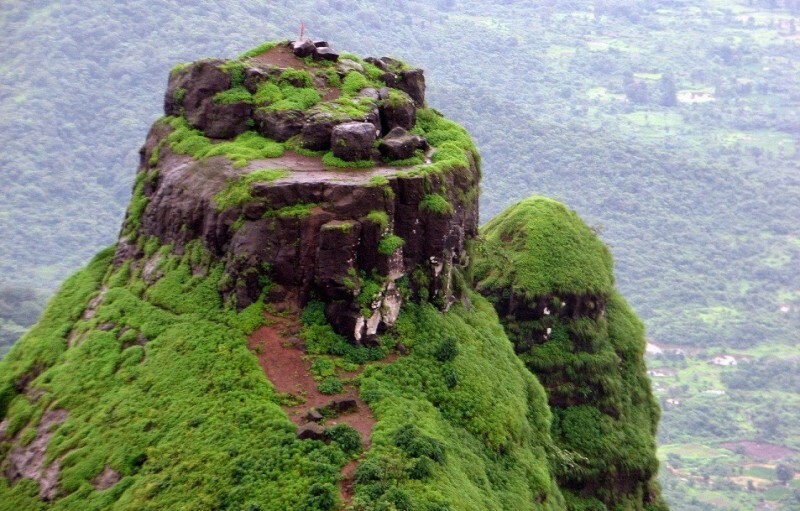 Prabalgad Fort, also known as Kalavantin Durg, is located between Panvel and Matheran in the Indian state of Maharashtra. 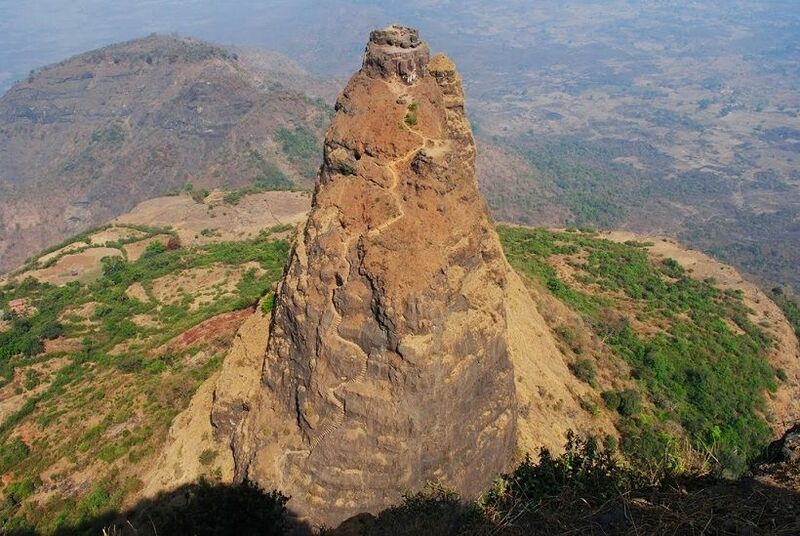 The structure is built at a height of 2300 feet on top of a plateau which is located close to Matheran. Previously, the fort was known as Muranjan until it was taken over and renamed by the Maratha forces under Shivaji’s rule. This fort is built of granite stones cut from the same hills. The bonding materials used here is the commonly used lime stone. It has got thick and strong walls, which are still not weathered off. 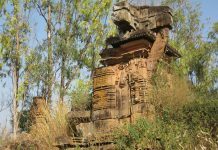 The fort contains a temple to Ganesh and some stone ruins. On the inner part, there are many small and medium complexes found here. It does have watch towers on its top. The fort can be approached via a chillingly steep climb. 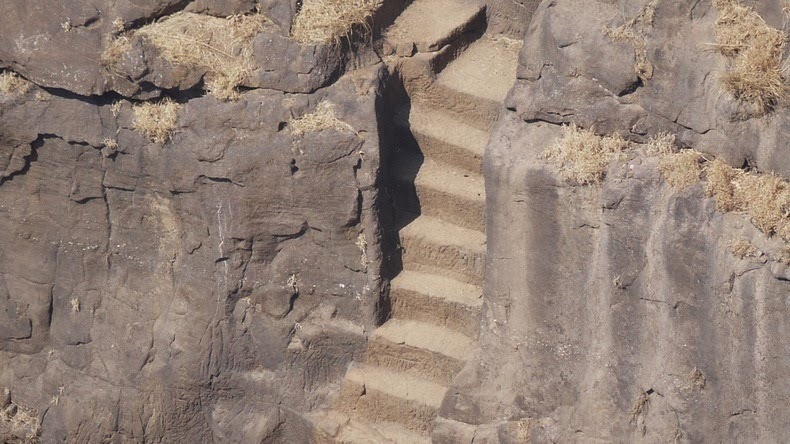 The steps leading up to the fort were cut into the rock of the hill. There are no safety rails on the edge and no ropes on the wall to grab on to. 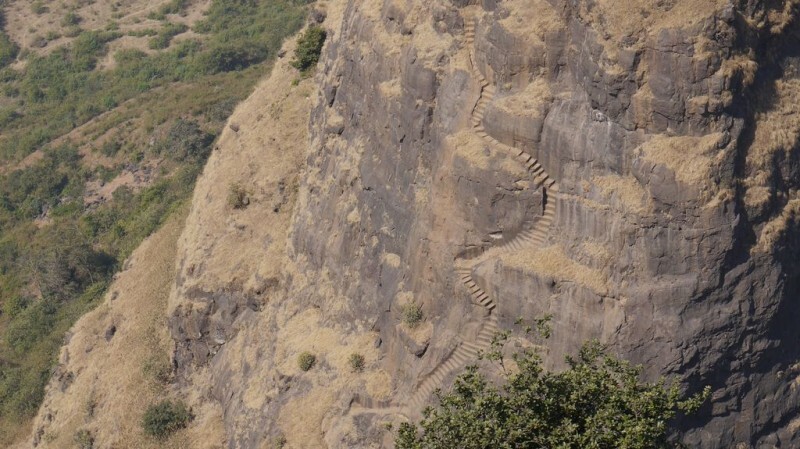 The origins of Prabalgad Fort are unknown but it is believed to have been built during the time of Buddha or in or around 500 BC for a queen named Kalavantin. 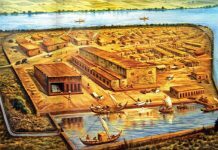 It is a bit saddening for an explorer to know that this is the only information locals can give and so many marvels and mysteries of the fort have died without leaving a record behind. Around 1458 Malik Ahmad, the prime minister of the kingdom of Ahmednagar, took over the fort during his conquest of Konkan. After the collapse of the Ahmadnagar Sultanate, the Mughals took control of Prabalgad along with Kalyan, Mahuli, Karnala and a number of other forts. 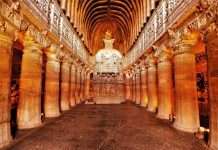 In the 1657 AD, the great Maratha King Shivaji Maharaj won this region with a great battle with the Mughals and took over this fort. At the time of the attack the fort was governed by Kesar Singh, a Mughal sardar, and was the only fort to put up a strong resistance. On seeing the signs of defeat the women in the fort performed Jauhar, a tradition of self immolation to ensure an honorable and respectful death. Kesar Singh died during the battle in October 1657, Shivaji in an act of kindness allowed Kesar Singh’s mother and her grandchild a safe passage out. Soon after the decline of the Maratha Kingdom and the advent of British rule made many Indian to revolt against the British. As such one of the first men who protested against the British was Umaji Naik Khomane. He is belied to occupy this palace and was residing here mostly as a hideout place from 1826 AD to 1832 AD. Prabalgad consists of a sister fort which is named Irshalgad Fort. 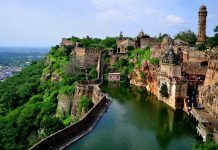 It is situated in the vicinity of the main fort and is comparatively smaller in area. 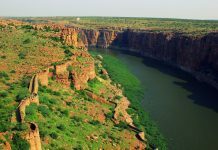 However there are numerous water reservoirs that were cut from rock. From the top of the fort one can see Peb, Chanderi, Karnala and Irshalgad forts. The City of Mumbai is also visible and catching a bird’s eye view of the surrounding makes one wonder how people must have built such a marvelous structure with simple tools.